If someone would have told me that I would become a bit of a fanatic with playing with six-sided shapes lovingly called hexagons a few years ago, I would have laughed out loud loudly. It started out innocently enough. I picked up a package of 1/4" pre-cut hexagon shapes at my local quilting shop. They were just too cute to pass up on, and of course, no one told me that 1/4" shapes are probably not the best size to use at first. The local guild I belong to (Clark County Quilters in Vancouver, Washington) was having a red/white theme for the year, and I thought it might be fun to enter. I had never entered a quilt into anything before so that intrigued me. I figured the 1/4" hexagons would be perfect because it would be fun and it would be fast because it would be a miniature. By now you are most likely shaking your head too because it was not fast in any sense of the word, but boy was it fun. I made up the tiny hexagons by the baggy full with no direction of what I was going to do with them. It was the most addicting thing I've ever done. Every spare moment I had was spent making them. It was better than chocolate chip cookies and more addicting than potato chips. I had to force myself to stop and come up with a plan of action to join them. Out came the colored pencils and hexagon graph paper as I began to play with layout. What you see above was my favorite design I drew. I pushed myself even further by adding in the white flange to give more depth of the border area. This was not easy to do on such a small scale. My only negative remark from the judges was on my flange join and I already knew it. I must have done and redone that join 10 times and I just couldn't get it any smoother. I contemplated removing it entirely but I think it made the piece better even though the join was not perfect. My Secret Garden's measurements is 10.5 inches by 11.625 inches. I didn't anticipate winning anything but really was looking forward to reading the judges comments. I was startled when I came around the corner and saw my little quilt hanging with two ribbons hanging on it that were bigger than it. 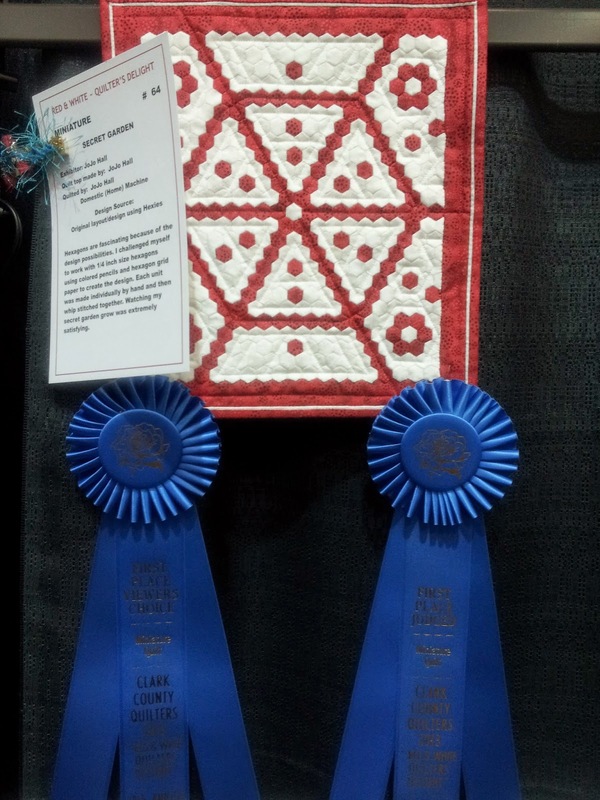 It was and still is a thrill when I look at the quilt and ribbons. I currently have several hexagon projects simultaneously going on right now. That simple shape has taken on a life of its own and it's been an amazing journey. This year I am teaching a Mystery English Paper Piecing block of the month. I've expanded the shape to include diamonds and triangles. I can hardly wait for the first class on January 31. I think no one could be more excited to share than I am. The funny thing is I am the worst and I mean the worst secret keeper. Christmas presents are nearly impossible for me to keep secret. I want to give it to the recipient as soon as I've wrapped it. I mean after all - it seems absurd to give the gift on the actual day it's supposed to be given. LOL It is killing me to not be able to share January's mystery block here right now! To keep me from letting the cat out of the bag on my Mystery BOM, I'm sharing another of my hexagon projects. It's called the Insanity quilt. I'm making it using Civil War fabrics. I've seen pictures of this quilt made up in lots of different fabrics but never Civil War. I'm so loving this quilt. The hexagon size I chose for it is 5/8 inch. The designer used 1/2 inch but I wanted to grow the quilt to a size better suited for us. There will be over 10,000 hexagons in the finished quilt. Here's how I stay organized color wise. My goal is to not have a repeat of the diamond shapes, but since I have to make 168 of these, I may have to cave and repeat. Here are diamond units patiently waiting their turn. Hey, did I already mention that making these are totally addicting!